If you were still alive, you would be 93 years old today. I was only with you once: Carnegie Hall, December 1985. It was your first concert on American soil after a few bad seasons and another retirement from the stage, and the last concert played in the old Carnegie before it was "fixed." You made us wait, that day, ten or fifteen extra minutes, just as you made them wait in 1965. When you came out on the stage with that funny waddling walk (I thought for a moment of my old muscle-bound gym teacher), I was overjoyed to finally see you in the flesh, to breath the same air as you, to hear the same sounds as you did, made by your fingers on your piano in your chosen concert hall. You bowed, and greeted the hall: first the boxes up high, then the family circle in the back - and then you looked down, closer, and began making brief eye contact down the front row, from your left to your right. Your eyes were coming toward me, and my heart began pounding. Then you and I were looking at each other. Without a moment's thought, standing like everyone else, I stuck out my hand and gave you a big "thumbs up." (You hadn't played in America for a while and I knew you might be nervous.) Those amazing eyebrows of yours shot somewhere to the back of your head; you gave me a blinding grin and pointed back at me, wiggling your finger back and forth as we looked at each other. Then you began to play: that Scarlatti b minor Sonata you favored in those years as a beginning, and I was hearing you at last. I had only heard your records and seen your London TV broadcast, so I was unprepared for how different your sound was in person. It was so much softer and more delicate, more variegated. It was not pushed out of the piano by force, you did not "strike" the keys. It walked out, sweetly and politely, like a debutante at her first ball, bowing to the assembled throng. When you were done with that first piece, I leaned to my right, over to my seat-neighbor, Robert MacAlear (who had done the discography for that Glenn Plaskin biography on you), and whispered "I had no idea of the finish, the smoothness." He just smiled and opened his coat a little more, to give his pocket tape-recorder a better sound path to your soundboard. And then, after the Scarlatti E Major Sonata that followed, while you were taking your bows, you did for the first time what you would do several times that Sunday afternoon: you looked back at me. What experiences followed. Schumann's Kreisleriana went over my head. By then I was entranced. I could hardly hear the notes. I mostly looked at you, at your back, so straight for a man of 82, your hair, your face, your hands. A fly buzzed in the strong stage lights around your back for minutes during the piece, and at one point landed on your morning coat. Lucky fly, to be so close. 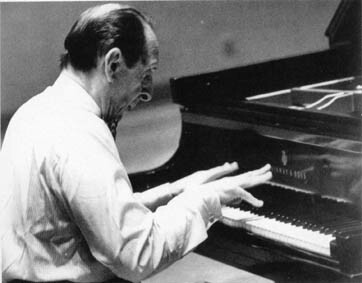 You finished Kreisleriana and embarked upon two Scriabin etudes. Melancholy quietude, almost ataraxia, in the Op. 2 #1 - could the composer really have been only 14 when he wrote it? - and wildness in the second, the Op. 8 #12, in d# min, with which you closed out the first half. Your fury in the climax was unlike anything I have experienced in my life, even in your recordings. Perhaps it was being there in your presence, but I have listened to that climax again (thanks to that tape recorder spinning in the coat pocket of my seat-mate) and it stands supreme. I almost pity you, Horowitz, for never could you sit in the audience for one of your own concerts and felt the things we felt. When you struck the two last chords of the Scriabin d#, throwing your arms up in the air, so immense and penetrating was the sound that I _felt_ the physical movement of the air, the shock wave, on my face and arms and in the pit of my stomach and through the seat. And you could never simply be the spectator for that, never experience someone playing the piano as you played it. It must have been hard always to be the giving one. Perhaps that is why in other areas of life you had the reputation of being difficult to live with, of being mostly a "taker"? And then came intermission, and I walked up to the lip of the stage of Carnegie, looked up at your piano, and began to weep. Some silly man saw me crying before your piano, and he said to me, very secure in his superior knowledge, that that was what you did to people. I just looked at him. As though I didn't know what you did to people! People. They came to me throughout intermission. They had seen our little gestures back and forth, and they came to ask me how I had come to know you, how I had come to be your friend. And I told them that we had never met before this day. They walked away, confused. And so you returned and played Schubert, then the sixth Schubert-Liszt Soiree de Vienne. Such quiet sounds, sparkling in space-time - and so many, in so many layers. When you had finished it, with what I didn't then know was your own ending (your endings were always better than the originals), you looked down at me and raised your eyebrows, pursed your lips down, and raised up your shoulders, as if to ask "So how did I do?" I smiled up and blew you a kiss in answer. Ahh, you great flirt: you batted your eyelashes at me, smiled a puckish smile, and covered up your cherry-red Clara-Bow mouth with one hand. My seat-mate leaned over to me, smiling, when you were looking elsewhere and said "Looks like you made a friend." And a woman sitting in back of me leaned forward and shook my shoulder, saying with the most comically broad Long Island accent, "You better be careful - he might lack that!" (Perhaps she thought it would be news to me that you were not immune to the charms of young men.) And I, feeling suddenly Noel Cowardish and witty, turned to her with a smile and said "You had better be careful, Madame: _I_ might like that!" After the short Chopin group before the A-flat Polonaise ending the program proper, people began to applaud, but you frowned, and waved your hand at them irritably, silencing them. True royalty: refusing the applause of the gathered thousands. I had lost track of the order of pieces and thought there might be another mazurka or something coming, so your sound in the E-flats that begins the Polonaise made me start in fear - I was expecting something so much quieter. And as you played through that Polonaise, with your sound so much less pointed and sharp than your recordings but so much more breathing-space, more air and wind in it, I forgot even you at last - there was just those sounds and that music. Even Chopin wasn't there, and certainly no "text." Just music, your music. Per se. When you concluded triumphally with those eight chords, the applause and shouting was deafening. You went right off stage, smiling to yourself. You never knew this, but after you left and before your first return, I looked around and saw that somehow there were actually some people still sitting down. How could they not stand? Angrily I waved my hand at them - up! up! And they obeyed, those who could see me, for numerous rows back. They were standing when you came back. Three encoures: Traumerei, which as always bored me; Schubert-Tausig Moment Musical in f minor, played sweetly and rhythmically, the three-year-old Horowitz riding his rocking-horse; and then Moszkowski's F Major Etude from the Etudes de Virtuosite, soft, even a bit slowly, but with exquisite evenness and control and endless spinning of jeweled scales. Then, somehow, the concert was over. You waddled over to the piano and slapped the fallboard down like a naughty boy: no more encores! And then you were there, standing above me, waving up to the boxes, taking your last bows. I waved at you and got your attention. You smiled and looked down, recognizing me. Something, I know not what, suddenly stirred in me. I took my index finger and pointed, jabbing a few times to make sure you saw it: first at my breast, then at my heart, then up at you, mouthing the words as I made the motions: "I - love - you." 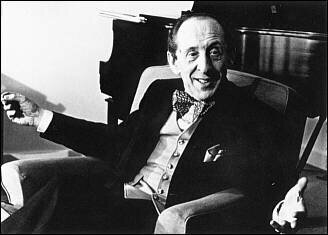 And, Vladimir Horowitz - do you remember what you did? You repeated the gesture back at me, mouthing the words as you made the motions, and then you bowed to me: one last time: smiling. And at that moment, as he stood in the wings, the New York Times photographer snapped the photograph that appeared in the review of that concert the next day. And that was the greatest moment of my life. And then you left the stage, and I never saw you again. I have listened to your 1968 recording of your own Carmen Variations surely 1,000 times by now. I even have videotape of the 1968 TV broadcast on which you played it. I've watched and listened to your 1982 London recording of the Rachmaninoff Second Sonata surely 1500 times by now. But nothing can compare to the afternoon I had with you. Thank you for that afternoon, and for the sounds that have made my life an utterly and forever and cosmically different life from what it would have been.